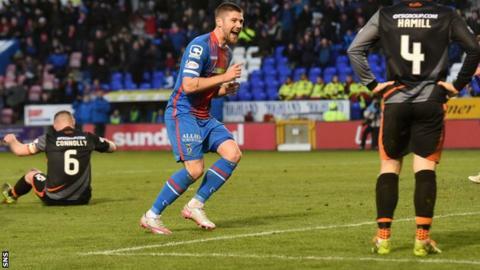 An Iain Vigurs double earned Inverness the points to send them within touching distance of the top six, but consigned Kilmarnock to the relegation play-off place. He capitalised on Kevin McHattie's calamitous error to tap home his first. Vigurs' second was well-worked, James Vincent's clever dummy allowing him to finish under little pressure. Mark Connolly gave his side late hope by touching home at the back post, but Inverness held firm to earn the win. Both sides had struggled to pick up points in recent weeks but Kilmarnock displayed great resilience in holding out for a draw with 10 men last weekend. The visitors seemed comfortable in the opening exchanges in the Highlands. The early opening goal arrived as a result of utterly abominable defending. The ball seemed to be going for an Inverness corner. Two defenders rushed to keep it in on the bye-line with McHattie only succeeding in handing Liam Polworth possession. His task was easy as he rolled the ball to the unmarked Vigurs, who really could not miss from close range. It seems the same old story for Gary Locke's Kilmarnock side. They can produce a 0-0 at Celtic Park and hold out for a draw with Dundee United when down to 10 men, but inexplicable moments like this could really be their undoing. Miles Storey almost utilised his pace to great effect, but a fine challenge prevented him from getting a shot away. The home fans began to voice their frustration as their side seemed to develop a tendency to play the ball backwards when an attack looked possible. Kilmarnock edged forward and Steven Smith went down on the edge of the box to earn a free-kick in a dangerous area - taker Kris Boyd went for power but watched his powerful shot rise over the bar. John Hughes' Inverness side took control with an incisive move that cut the visiting defence open. Storey squared from the right and Vincent concealed his intention to let the ball roll past. Vigurs was in position to pick his spot. Kilmarnock tried to respond but a terrible free kick from Mark O'Hara which missed by a mile summed up their afternoon. Jamie Hamill screamed for a penalty when he drove the ball towards goal, but referee Barry Cook ignored his claims. The hosts could have gone further ahead. Josh Meekings almost netted with a fiercely-driven cross that narrowly missed the back post, and Andrea Mbuyi-Mutombo came close from distance. Connolly found space at the back post after a corner was nodded down to tuck home. Greg Kiltie then fired narrowly off-target. The win gives Caley Thistle hope they can drive into the top six with their next opponents Dundee United. It is a significant setback for Kilmarnock, for whom Aberdeen lie in wait. Match ends, Inverness CT 2, Kilmarnock 1. Second Half ends, Inverness CT 2, Kilmarnock 1. (Inverness CT) wins a free kick in the attacking half. Corner, Kilmarnock. Conceded by Gary Warren. Attempt saved. Greg Tansey (Inverness CT) right footed shot from the centre of the box is saved in the bottom left corner. Kris Boyd (Kilmarnock) is shown the yellow card. Attempt missed. Greg Kiltie (Kilmarnock) right footed shot from outside the box is just a bit too high. Attempt missed. Tobi Sho-Silva (Inverness CT) right footed shot from a difficult angle on the right is close, but misses to the right. Goal! Inverness CT 2, Kilmarnock 1. Mark Connolly (Kilmarnock) left footed shot from the centre of the box to the centre of the goal. Assisted by Conrad Balatoni following a corner. Corner, Kilmarnock. Conceded by Carl Tremarco. Substitution, Kilmarnock. Scott Robinson replaces Jamie Hamill. Substitution, Inverness CT. Tobi Sho-Silva replaces Iain Vigurs. Substitution, Inverness CT. Carl Tremarco replaces Nathaniel Wedderburn because of an injury. Attempt missed. Josh Magennis (Kilmarnock) right footed shot from outside the box misses to the right. Attempt missed. Liam Polworth (Inverness CT) right footed shot from the right side of the box is close, but misses to the right. Attempt blocked. Jamie Hamill (Kilmarnock) right footed shot from the left side of the box is blocked. Hand ball by Greg Tansey (Inverness CT). Substitution, Inverness CT. Andrea Mbuyi-Mutombo replaces Miles Storey because of an injury.